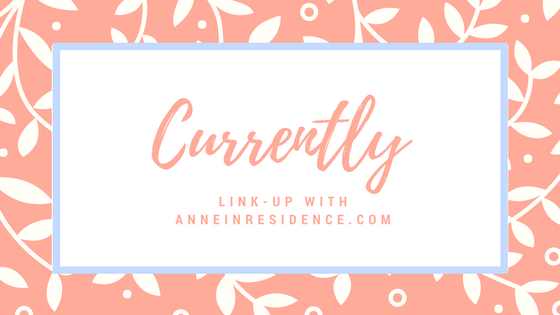 Anne, at In Residence, hosts a linkup on the first Wednesday of every month and invites readers to share a few things that they are currently up to. Be sure to head over to Anne’s blog and see what everyone is up to this month. experiencing – All the Springtime feels! I am so ready for Spring weather and to be able to go play outside with the girls in the evenings and on weekends! appreciating – This goes along with the one above…I am appreciating Spring and all it brings. I am so thankful that God created different seasons to show us how things go through cycles. It is such a visual representation of how life goes in cycles/seasons as well. I am appreciating all the new growth starting to appear in the form of flowers/animals/trees, etc. posting – I’ve been trying to be more consistent about posting here. It’s hard to find the time, but it’s something I really enjoy and am looking forward to hopefully making this a more constant thing in my life. considering – I have a hair appointment scheduled for this Saturday and I’m considering getting bangs again. I really liked them when I got them back last winter and got a lot of compliments on them. If I get them again, I’ve just got to do a better job about getting them trimmed on a regular basis. Check back on May 1st, when we will be discussing what we are currently admiring, playing, borrowing, remembering, and finishing! I am always wish listing books. It’s a problem. LOL I’m excited that it’s Spring too though. It should be warming up more as the day goes on, and I’m so happy! Yes my to-read book list is super long (almost embarrassingly too long)! I love the Spring too! Warmer days, chilly nights and the thunderstorms! I’m watching for the least signs of spring to encourage me that it might really be here! I know…you never know what to wear because one day it’s warm and the next it’s freezing cold! I’m ready for Spring to truly be here and stick around awhile!